Order your William Henry Limited Edition Zurich Panama Money Clip today from FahrneysPens.com. Fine Pens, Refills & Luxurious Gifts – great prices & fast shipping. The William Henry Limited Edition Zurich ‘Panama’ Money Clip features a frame in hand forged 'Twist' Mokume Gane (the ancient Japanese forging art used to decorate the hilts of Samurai swords) by Mike Sakmar. 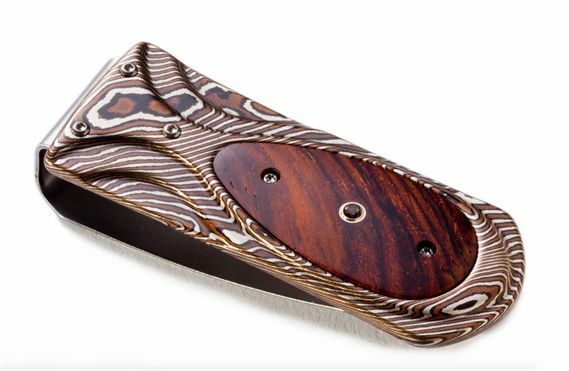 The inlay is cocobolo wood, punctuated with smokey quartz. The clip is machined and polished from tempered stainless steel, with a beautiful engraving bright cut against the matte-finished background. The ‘Panama’ money clip is a beautiful, and functional personality statement featuring some of the exotic materials and forged metals that are the hallmark of William Henry's collections; a timeless heirloom to be proudly worn and used for a lifetime before handing it down to another generation. Limited to 988 numbered pieces.